Louisiana bayous don’t just appear in New York City, and the closest you get to seeing an alligator is when its hide is wrapped around a designer handbag. But in February both popped up in Manhattan’s Chelsea Market as a promotion for the History Channel’s reality show, “Swamp People.” Behind the transplanted swamp — complete with live gators, 7,000 gallons of water and 15-foot-tall cypress trees — was none other than Flagler alumnus Greg Lund, ‘85. Lund isn’t a gator hunter, but co-owner of the Orlando-based Bottled Ocean. The aquatic management company was hired to design and construct the elaborate exhibit promoting the third season of the show that chronicles alligator hunters as they troll Louisiana’s endless bayous. The 12,100-cubic-foot bayou included more than 1,000 plants indigenous to Louisiana swamps and that sat below docks that visitors walked along. Large, unique projects — especially that sport gators — have become the norm for Lund and Bottled Ocean, which expects revenue of $1.2 million this year. The company has evolved from humble beginnings as an aquarium builder to designing and managing massive aquatic displays stocked with any number of underwater critters. Bottled Ocean manages the 360,000 gallons of sprawling waterways inside Orlando’s 1,400-room Gaylord Palms Resort and Convention Center. The company is working on a project with Sea World’s Discovery Cove and also helped develop a gator-filled Louisiana bayou in the $500 million expansion at Paragon Casino in Marksville, La. All total, Bottled Ocean oversees more than 400,000 gallons of man-made waterways, both salt and freshwater. To put that into perspective, an average pool holds 8,000 to 10,000 gallons. Lund wasn’t always in the aquatic management business. In fact, he landed in it by chance. After graduating from Flagler, he spent 17 years in financial services as a stockbroker in Miami and Orlando, escaping whenever he could to the Bahamas. They struggled to find good help to clean and service the tanks until he came across his current Bottled Ocean partner, Baron “Bear” Kozy. Kozy pitched the idea for starting a business to build and maintain aquariums, and in 1996 Lund started managing the fledgling business on the side while selling stocks during the day. Only in 2004 did he jump ship and go full time with Bottled Ocean. “I put my flip-flops and shorts on and haven’t looked back since,” he said. The company landed its first big break when it won a contract to build lobster and fish tanks for Red Lobster restaurants around the country. “That really kind of propelled us to another level,” he said. 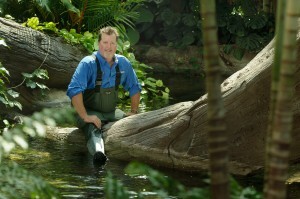 Ever since, the company has been diversifying, moving away from standard aquariums and into managing larger, more unique projects like Gaylord Palms. Lund said when they signed on with the resort, the chlorinated waterways running through the hotel property held nothing but fake fish. At Gaylord they handle everything from the massive filtration systems to finding new fish that are introduced into the exhibits. Kozy is the designer and engineer, while Lund runs the business side. But as with most small businesses, he often finds himself getting his feet wet, and even handling the gators. Lund is now hoping the exposure from the History Channel job will lead to even bigger projects, not to mention more time fleeing land-locked Central Florida in search of fish.